The Parent Network’s Fall 2012 free seminar series is under way and this week’s topic was “How to Launch a Young Adult.” Richard B. Cohen LMFT, MAC, CCBT, CDVC, discussed the importance of adult children growing up and how many parents perform a disservice to their child when they don’t make them face tasks that this same adult child will eventually need to perform on their own. For example if a person grows up without ever having learned to clean, do laundry or cook for themselves, how are they supposed to know how to do this on their own? Richard stressed “care, not caretaking.” Richard told the parents in attendance not to solve their kids problems but rather empower them by letting them figure it out on their own. If your child gets parking tickets when using your car, don’t bail them out by paying them. Doing so provides no consequence for the child to change their behavior. Richard posed some interesting questions for the group such as “Who is responsible for the adult child’s life? The parent or the child? And at what age?” For parents who were not in attendance and are interested in attending this same seminar, Richard will be giving this lecture again on November 7th, 2012 in the San Fernando Valley at our Encino facility located at 16501 Ventura Blvd Suite 104. To RSVP please call 818-465-9985 ext 113. This week’s seminar was “The Parents’ Relationship and the Successful Child” and presented by Richard B. Cohen, LMFT, MAC, CCBT, CDVC. Richard spoke on how the way children feel about themselves can be directly related to manner in which their parents treat each other and parent together. Richard shared scenarios of different behaviors and their potential consequences. If parents do not listen to each other then they risk the danger of raising a child that will not listen to others. That is what the child is witnessing over and over again. If the parents get violent with each other then their child may grow up thinking that this is acceptable behavior. On the more positive side, Richard noted the benefits that can occur when either parent is able to do the same task with their child, rather than the child only going to one parent to complete tasks Richard also gave advice for single parents and how important it is for parents who are apart to not bad mouth each other. The parent may still be dealing with their feelings however this sort of behavior clearly does not benefit the child. Dr. Philantha Kon, M.D., Ph.D. lectured last night on “Mood Disorders and the Use of Marijuana in Teens.” Dr. Kon presented a great deal of information and statistics regarding teen depression. Dr. Kon discussed perceived barriers to care such as stigmas, myths and media perception. Dr. Kon mentioned many of the harmful effects of THC on a growing brain. She also shared that teen use of marijuana is a significant predictor of later depression as young adults. Dr. Kon talked about the self-medicating aspect of marijuana use, and how using it can often be an attempt by the individual to fix other issues such as anxiety. Yet by using marijuana, the person does not get to deal with the underlying issue. In terms of parents protecting their children from marijuana, Dr. Kon stressed the importance of monitoring and supervision. D. Kon also said how important it is to set limits and be consistent with your parenting. We have received multiple requests to for Dr. Kon to do this same seminar in Encino and will keep you posted on the date it occurs. “Recognizing and Understanding Addiction” was the topic at our most recent Encino parent seminar. Our lecturer for the evening was Dr. Robert Waldman, MD, Internist and Addictionologist. Dr. Waldman explained how addiction is brain disease that is both diagnosable and treatable. Dr. Waldman emphasized the difficulty in breaking patterns, and that it usually takes more than just willpower to stop compulsive behavior. change in productivity (such as grades at school). Dr. Waldman shared that drug use can often be an attempt at self medicating, rather than a person going to talk to a professional about what bothers them. Dr. Waldman suggested that parents who catch their children using drugs, should ask them why they are using them. Dr. Waldman said the common answers are peer pressure and depression. Dr. Waldman said it was especially important for young people to avoid using drugs due to their brain’s not being fully developed yet. The topic Wednesday night at our parent seminar in Encino was “When Parents Feel Powerless.” Richard shared tips on how parents can renew their sense of self respect. Richard reminded parents that while they cannot always control their child’s behavior, they can be in control of how they react to it. Richard emphasized that a parent must first respect themselves in order to overcome feelings of powerlessness. Richard then ran through scenarios that some of the parents in attendance shared. This topic was so rich that we have a scheduled a “part two” in in two weeks called “Overcoming Powerlessness.” We also plan to cover this topic at our West Los Angeles office. 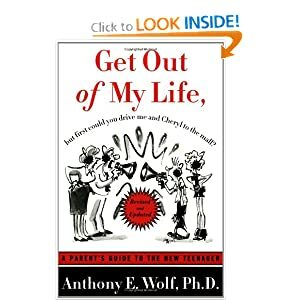 Many parents in attendance shared the feeling that they are in a ‘wait and see mode’ for any effort or attention that goes into the relationship with their teens and that the teens hold all the power. Richard urged parents to take back the reins and be an active participant in the process. Make appropriate and ‘friendly’ demands on your family members for the relationship you want to have. Stated clearly and appropriately, your needs are important too. Your kids do want your love and a connection that goes beyond feeding and driving. When they know you want that too, it can be a great starting point. Upon the request of some parents, Richard revisited the works of A. Rae Simpson and the different steps of parenting, and Diana Baumrind’s work on the styles of parenting. Authoritarian: The authoritarian parent attempts to shape, control, and evaluate the behavior and attitudes of the child in accordance with a set standard of conduct, usually an absolute standard, theologically motivated and formulated by a higher authority. She [the parent] values obedience as a virtue and favors punitive, forceful measures to curb self-will at points where the child’s actions or beliefs conflict with what she thinks is right conduct. She believes in keeping the child in his place, , in restricting his autonomy, and in assigning household responsibilities in order to inculcate respect for work. She regards the preservation of order and traditional structure as a highly valued end in itself. She does not encourage verbal give and take, believing that the child should accept her word for what is right (p. 890). Permissive/Democratic: The permissive parent attempts to behave in a non-punitive, acceptant and affirmative manner towards the child’s impulses, desires, and actions. She [the parent] consults with him [the child] about policy decisions and gives explanations for family rules. She makes few demands for household responsibility and orderly behavior. She presents herself to the child as a resource for him to use as he wishes, not as an ideal for him to emulate, nor as an active agent responsible for shaping or altering his ongoing or future behavior. She allows the child to regulate his own activities as much as possible, avoids the exercise of control, and does not encourage him to obey externally defined standards. She attempts to use reason and manipulation, but not overt power to accomplish her ends (p. 889). According to Baumrind, the child’s behaviors (below) are linked to their respective styles of parenting. self-confident about ability to master tasks. rebellious and defiant when desires are challenged. Nurturing parents who are secure in the standards they hold for their children provide models of caring concern as well as confident, self-controlled behavior. A child’s modeling of these parents provides emotion regulation skills, emotional understanding, and social understanding. Parents who combine warmth and rational and reasonable control are likely to be more effective reinforcing agents. They praise children for striving to meet their expectations and making good use of disapproval, which works best when applied by an adult who has been warm and caring. Authoritative parents make demands that fit with children’s ability to take responsibility for their own behavior. Children subsequently learn that they are competent individuals who can do things successfully for themselves. This fosters high self-esteem, cognitive development, and emotional maturity. Some of the parents at Paul Revere participated in Richard’s seminar Tuesday morning entitled “Deepening Your Relationship With Your Teen”. Richard utilized role-playing with parents on realistic dialogues with teens and how to turn the conversation around to reach a better conclusion. Letting your teen know that you are interested in their life, and eager to have a meaningful relationship is very important. Stating your needs in the relationship, in an appropriate way, can not only get you closer to your goal with your teen but also model how to express needs in a productive and non-threatening way. This can be helpful for teens later on when they are negotiating their own relationships. Richard maintains that having clear family expectations, values, and rules can help your teen navigate the family dynamic. Having real time together, such as preparing a meal or walking the dog on a regular schedule can provide closeness as well as structure. Since the last blog entry in November, Richard has spoken at several West Side schools, covering a variety of parenting topics. We also continue to have free parenting seminars here at our office two Wednesday evenings each month at 7 pm. Be sure to check the parent network calendar on our website for dates and topics. Remember that even though these seminars have a specific topic, you are welcome to bring any issue into the discussion. Out next seminar is tonight, Wednesday February 9, 2011, and the topic is “Emotional Quicksand- How (Not) to Stay Stuck in Conflict With Your Teen.” Sandwiches and coffee will be served. We had a lively discussion at the Marquez Elementary School about honesty and how to build trust in relationships with our kids. Some parents shared their resistance to tell their young children about their previous marriages. Richard maintained that age appropriate details, shared openly and honestly is one way of creating a safe environment for children. Sharing your life story builds trust and intimacy in relationships. It encourages others to share in kind. Of course, cultural differences are taken into consideration and respecting each family’s unique dynamic is honored. At Palisades High School Richard talked about anger. Richard stressed the importance of having clear guidelines in your family of what behaviors are encouraged and what are not. Setting up a framework of “these are the things that are important to our family” can preclude the cycle of anger and acting out. Conversations about Honesty, Integrity, Perseverance, Responsibility, Respect, Empathy or whatever your family holds dear, can set a tone for your family. When a crisis arrives, and the dialogue gets heated, you can refer to your family values and maintain that the “discussion” must stay within the confines of ‘Respect’ or that you are willing to wait until it can be handled with that in mind. Staying neutral as a parent is key to keeping things cool and modeling that shows that conflict can be handled respectfully. This ultimately gets better results. Allowing anyone to treat you disrespectfully enables that person to continue to abuse you. This has a very negative impact on all players. We are still recommending “Nurture Shock” by Po Bronson and Ashley Merryman, and “Mindset” by Carol Dweck, as great reads. Chapter Two, on sleep in Nurture Shock is fascinating and likely will encourage you to re-think the sleep patterns of your teens at home. Today’s topic at Paul Revere was “The 5 Steps Of Parenting”. We had twenty or so parents in attendence. Psychotherapist Richard B. Cohen covered the issue of respect, and how parents must model respectful behavior in their family to create a respectful climate overall. The more effective parents are at stating their needs and goals for the family in a clear and appropriate manner, the more they can empower their children to understand and recognize their own needs, and how to assert them effectively. In regards to future seminar topics, one parent suggested the impact of violent video games on teens and how families can deal with this issue. Our topics at Paul Revere are set for the school year, but suggestions like these can be submitted for next year. Richard also mentioned that we are starting an evening parent support group at Palisades High School. Perhaps this is something Paul Revere parents might be interested in as well. Please talk to your school representative. Remember that you can go to any LAUSD seminar listed on our calendar, and you are always welcome at the free parent skills training workshops at our office, every other Wednesday night. Check the seminar calendar on our website for those dates and topics as well. This is not a “one size fits all” process. It is best to gather information and then make it fit for your own family. This applies to goals, financial concerns, and family priorities. Start a “lite” conversation early, then allow some time for it to be processed. If it feels appropriate, schedule an early preliminary meeting with a college counselor to plant the seeds for further consideration. This can be done in 9th or 10th grade. College counselors can start your child thinking about who they are, how they want to present themselves, and where they might want to go in very broad terms. Early visits to a small, medium and large school can provide some clarity for students. Sample a rural and urban setting. This can be done locally to give your child some idea of the general feel of a campus. Some kids love a city school like USC, and some kids want the community that a school with a strong central campus offers. Distance can be a factor as well, such as a school in a location that has direct flights. The cost of traveling to and from school for family visits and holidays should be factored in. Organizationally we recommend that you set up a gmail account in the student’s name and use that for all college related business only. Set a simple password to be shared by the student, the parents and the school counselor. Use the same name and password for your College Board account. This will centralize all college email. If you use a computer, you can open a new folder on your desktop. Within that folder have secondary files for: 1) personal information like previous schools, important dates, social security number and personal stats, 2) a resume; keeping track of sports and activities like music or art, summer jobs, even babysitting counts, references, special accomplishments and awards, community service and anything else that you would like on a resume. 3) the list of schools with addresses you are interested in, 4) essay prompts, outlines and eventually essays, 5) misc; this could be any tidbits of information you find interesting that you want to keep handy or remember. Do this early and you will be glad to have this done once your child starts doing the applications. Encourage your child to use google docs to save their essays, or email themselves their work on a regular basis. This will allow them to access their work from anywhere such as school, the library, or a friend’s house.